If you advertise on Facebook, there were a series of announcements made today about features that could improve the effectiveness of your ads. While my excitement is focused primarily on the Website Custom Audience enhancements, the updates to Dynamic Ads is important for big e-commerce websites. 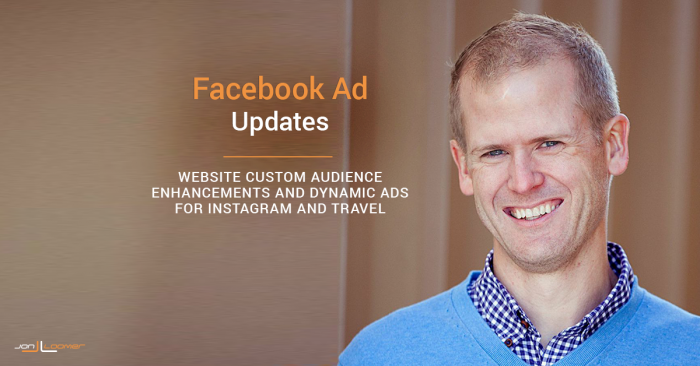 On February 17, 2015, Facebook announced the launch of Dynamic Product Ads, a way for advertisers to show ads dynamically to Facebook users based on products they previously visited on that advertiser’s website or mobile app. Well, Facebook is ditching “Product” from DPAs and will now be calling them Dynamic Ads going forward. This change makes sense particularly due to the concurrent announcement of Dynamic Ads for Travel, which don’t focus on the sale of tangible goods. Dynamic Ads make advertising infinitely easier, particularly for e-commerce websites with hundreds or thousands of products. Without Dynamic Ads, an advertiser would need to manually create an ad and Website Custom Audience for each product they are selling. 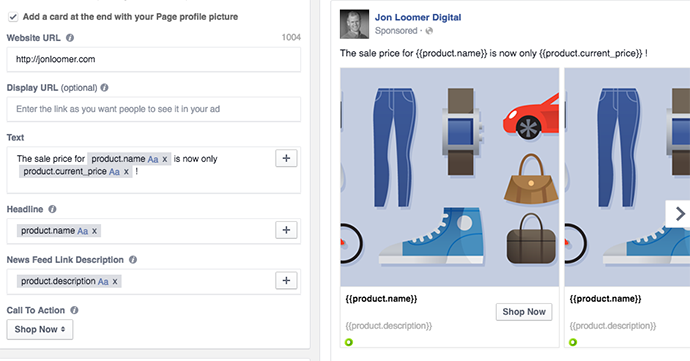 Dynamic Ads work by providing Facebook with a product catalog and an ad template that would change based on factors like viewing a product, but not purchasing. I’ll be providing a detailed tutorial on Dynamic Ads in the near future. One limitation to Dynamic Ads in the past was that placement was limited to Facebook (Mobile News Feed, Desktop News Feed and Right Column) and Audience Network. But now advertisers will be able to reach the more than 400 Million monthly users on Instagram. Nearly 1 Billion users access Facebook via a mobile device every day (as of Facebook’s Q1 2016 earnings report), and 894 Million access Facebook only from mobile on a monthly basis. With that shift, it becomes increasingly important that advertisers can reach those mobile users. Marketers are already promoting their products via Instagram, but now they will be able to do it dynamically with Dynamic Ads. The option for Instagram should now be available when selecting placement while creating a Dynamic Ad in either Power Editor or the ad create tool. This is an interesting pivot for Facebook and a nice enhancement for the hospitality industry. A travel website can now dynamically show ads for a hotel or group of hotels based on travel intent. For example, if a user is browsing hotels in a certain destination, advertisers can show other hotel options in that same location. This also applies to showing ads to users who purchased a flight. Advertisers can now show ads for hotels in the destination where a user recently booked a trip through their website or mobile app. Availability and pricing will also be dynamic, making sure that users are only shown ads that remain relevant. And they have the ability to show ads for hotels based on class — so if someone is searching for a low cost option, they are only shown similarly priced hotels. Finally, advertisers with access to Dynamic Ads for Travel will be able to target based on booking window. So if a flight is booked for Monday through Thursday, the advertiser can be sure that they are showing options with pricing and availability that are relevant. A representative from Facebook tells me that Dynamic Ads for Travel will initially be made available to managed accounts only. If this is a feature you need, ask your ad rep (if you have one). While this is being rolled out for the travel industry, expect it to expand to other industries in the near future. My business is neither e-commerce retail nor is it travel, so my interest in the announcements above are merely vicarious. 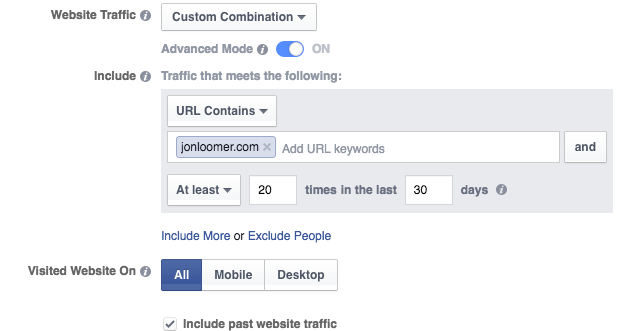 But enhancements to Website Custom Audiences? This is big for a website like mine. I get enough traffic to my website that I no longer need to target interests or Lookalike Audiences — people who may not know who I am. Instead, I focus almost exclusively (probably 99% of the time) on targeting my website visitors. By targeting my website visitors, I am reaching those people who already know me. I can also show relevant ads based on specific pages of my site that they visited — and when. I routinely find that by targeting website visitors I not only get the best cost, but the highest quality. But there has been one major weakness with Website Custom Audiences: Not all website visitors are created equal. Of the people who visit your website every month, how many of them only visited once? How many visited 20 times or more? How many bounced after three seconds? How many spent an hour on your website? Up until now, you could filter out your most valuable visitors by targeting people who visited confirmation pages or by using a few creative approaches. But Facebook needed a better way to target the most valuable visitors. These Website Custom Audiences will apply to both website visits and actions from standard events. If you don’t have the new Facebook pixel installed on your website utilizing standard events, it may be time! Frequency and Device rules will be available within Power Editor and the Ads Manager, but all other rules will need to be accessed via the API. The rollout of enhanced Website Custom Audiences will be taking place during the coming months. To access this feature from Ads Manager or Power Editor, select “Custom Combination” when creating a Website Custom Audience. Then be sure that “Advanced Mode” is turned on. I dive into more detail on this new feature in my hands-on tutorial. How do these updates impact your business? What are ways you might use them?